"It's already 2pm. I don't think we'll make our flight." The TTC has closed the subway system. My sister and I are stuck on a TTC bus, in downtown traffic on the busiest street during Sunday afternoon, trying to get to the airport by 2:30pm. We still had a 1-hour long subway ride ahead. Even though it was nice to bump into a friend on the bus, we needed to go. My sister and I bit the bullet and hailed a taxi instead. "We need to get to the airport by 2:30pm. Our flight leaves at 4pm. Can you take us there?" I asked. "Yes, no problem. I'll get you there by 2:30pm." The taxi driver affirmed. And as promised, we were running to the ticket counter with backpacks and a luggage in tow at 2:30pm. Thank you taxi driver! "I haven't been assigned a seat yet. My ticket says PTE." my sister said. I had no clue what PTE meant. The ticket lady said my sister was on stand by. Luckily, we were both able to get on the plane, albeit, my sister sat some 6 rows ahead of me. The flight to Halifax was a bit bumpy but I was mostly distracted by the movie Kingsman: The Secret Service. The movie had just finished before the flight attendant announced we'll be landing in 10 minutes. That's the kind of flight I like. Halifax airport is relatively small. We were just a couple of gates away from our connecting flight to Deer Lake. We had some time to grab a quick dinner at the airport Timmies. After our steak and cheese panini and turkey bacon croissant, it was time to board the next plane. It was merely an hour flight from Halifax to Deer Lake. It wasn't enough time to watch another movie, not that anything was really interesting to watch anyways. I had a better time chatting with my seat neighbour, a professor at a local college that was returning from the Middle East. We shared (my limited) teaching experiences and some teaching philosophies, then we were flying over the middle of Newfoundland. "There is still snow on the ground!" I exclaimed. "It was still snowing a week ago. You'll likely see snow on the trails." she said. "You'll enjoy Gros Morne Mountain and Tableland. And I highly recommend Green Gardens." She was referring to three hiking trails at Gros Morne National Park, a UNESCO World Heritage Site that had been one of the top travel destination on my Canadian list. We'll be there tomorrow. My sister received the same recommendations from her good-nature seat neighbour as well. People in Newfoundland are simply hospitable and they want to share their island with visitors. We are there to partake. 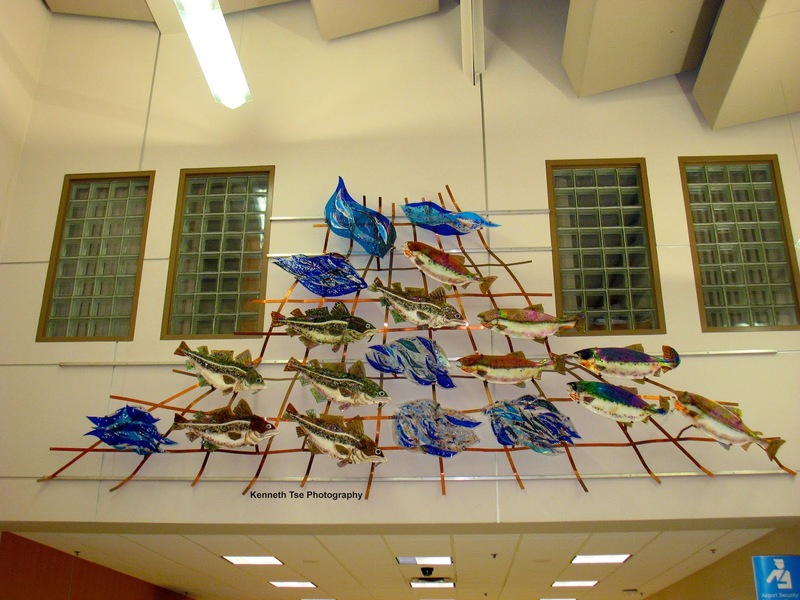 While we waited for our rental car, I admired some of the artwork at Deer Lake Airport. 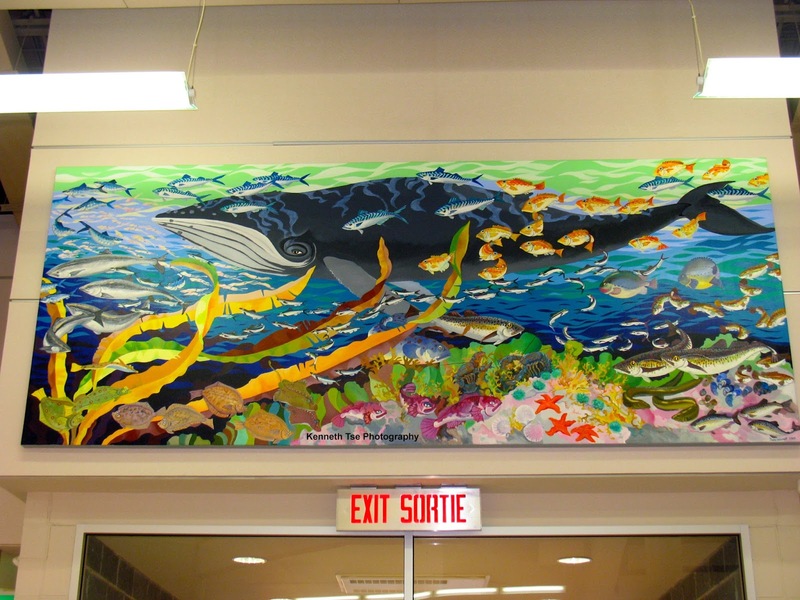 Newfoundland has a rich, colourful and vibrant fishing tradition. The artwork represented this culture very well. Deer Lake is small so it took no time to arrive at our Holiday Inn Express. It was evident that this hotel was only a few years old as everything looked spotless. This would be our most comfortable stay of the whole trip (not that I don't like camping). "How's the weather for the next three days?" I asked the hotel lady. "Tomorrow is clear and warm. There's rain on Tuesday. Wednesday may rain later in the day." We'll be in Gros Morne until Wednesday. With a rainy day in the middle of our visit, we'll have to take advantage of our time as best as possible. My sister and I decided to move our Gros Morne Mountain hike forward to Monday afternoon. It will be a long day tomorrow, so we were in bed before 12am. Yet, I couldn't fall asleep. I was simply too excited.